When my wife and I first landed on Roosevelt Island, we were thrilled to have a grocery store — it was too small to be a supermarket, then — across the street from our new apartment in Manhattan Park. It was one of the features that allowed us to do the unthinkable, getting rid of both of our cars on moving day. We followed the movers from Montclair, New Jersey, to Manhattan on a bus. With no more car payments or insurance, no coasting up and down blocks in search of parking places and no more traffic jams, we got settled on Roosevelt Island, fueling the exhausting transition with frozen pizzas from Sloans, Gristedes much smaller predecessor. Over the next twenty-five years, as Gristedes took over space beneath Motorgate and grew larger, our use of the store got smaller. A lot smaller. Yet, I sling a giant IKEA bag over my shoulder to carry groceries home from Fairway and Trader Joes, and a weekly jaunt to the Union Square Farmers Market is a must for us. Like many of my neighbors, with whom we share elevators crowded with bags from Whole Foods, I can see Gristedes through our lobby windows. Sometimes, it just strikes me as absurd. You know what they say about trust. Once lost, it’s nearly impossible to get it back. That wisdom haunts Gristedes today. Sloans as well as the early Gristedes earned its reputation by taking its captive Roosevelt Island audience for granted, or so it seemed. If you didn’t like it, where else were you going to go in the days before you could catch an easy subway to Fairway, Trader Joes or Whole Foods? A lot of us trammed it to Second Avenue and spurred out to Food Emporium or the deep discounts at Pioneer. We took a snobbish pride in refusing to accept what Sloans/Gristedes shoved at us. It was difficult, though, for Roosevelt Island’s elderly and disabled population and especially for those with budgets so tight that the cost of tram tokens was not an easy add-on. They went to the store beneath Motorgate as did others who considered using our local businesses an act of community loyalty. After all, where would we be without Gristedes, not a single supermarket on the island? But what was it that Sloans/Gristedes shoved at us that turned so many people off? It started with prices. Although Roosevelt Island’s demographics more closely resembled the nearby neighborhoods in Queens, Gristedes lumped the local market in with their Manhattan group. Upper East Side prices for Queens customers. If you had a choice, you just wouldn't shop there. It was upfront, and it was insulting. Those of us who could were so eager to shop off-island that the Main Street WIRE financed its operation for years on advertising inserts from Trade Fair on 36th Avenue. You’d see Roosevelt Islanders lugging grocery bags across the bridge, and RIOC set up a shoppers bus that passed Gristedes on their way to buy groceries in the borough next door. Rumor had it that Gristedes’s deal for the space was so sweet that losing shoppers was of little or no concern. They’d make enough on the light traffic wandering through. And there was, of course, the shelves frequently stocked with goods with past due dates. Another rumor was that the Roosevelt Island store was the terminal market where expired goods from Manhattan got dumped. One thing for sure, you learned early on to check the sell by dates before putting anything in your basket. You can imagine how that affected sales of less stable goods like meats and vegetables. Stomach turning stories of rancid meats and fish so foul-smelling you might not eat all day after getting a whiff were plentiful. Surely, not all the stories were true, but enough were to keep shoppers away, some never coming back. Trust is a big one. Are We Treating Gristedes Fairly? A couple of years back, James Catsimatidis, Gristedes’s owner, came to the Chapel of the Good Shepherd for a town meeting. It was hosted by David Kramer, whose company is responsible for managing Main Street retail, and it was the second time Catsimatidis came in for a roasting. You had to give the owner credit. He sat there for an hour, parrying accusations, questions and complaints, without once losing his composure. After the meeting, which I covered for the local print newspaper, Catsimatidis posed lightheartedly with Kramer for a photo. “Pretend you like each other,” I coaxed. It didn’t get the hoped for smile from either. But back to the town meeting. Before, during and after local residents stepped up to the microphone to increase his awareness, Catsimatidis outlined plans for improving his store — without ever really agreeing with the complaints. His position was positive, not especially defensive, although he did defend his prices. He was not going to go out of business through bankruptcy as his competitors were, he insisted, by bending too far to keep customers happy. In an informed nod to residents, he pledged to redesign the local store to make it more friendly, adding more organics to respond to consumer enthusiasm and continuing to carry the Shop Rite brand items that had brought improved prices to many commodities stocked on his shelves. While people wondered out loud whether he was upgrading his stores to enhance his candidacy for mayor — he lost in the primary — he chuckled calmly when the question was asked. Renovations did come. The look of our “mega store” improved. Suspicions were that all that would roll back as soon as the campaign to replace Michael Bloomberg ended. A legacy of our early experiences at the market, my wife and I seldom shop at Gristedes, although the store is just a short walk across the park from us. We buy Shop Rite coffee filters and yogurt at great prices. Sometimes, we also buy a muffin but find the selection too limited and unpredictable to rely on. In the bin where baked goods wait, labels are often comically wrong, unless chocolate is sometimes green and pistachio brown. Some are just mystery muffins, no label at all. But that’s inconsequential. Vegetarians who add fish to our diets and cook at home about 90% of the time, we rely heavily on farmers markets, like Union Square’s, where you buy a potato that was relaxing quietly in the ground yesterday. Gristedes can’t compare for freshness nor for direct from market prices. For other commodities, because we are lucky enough to own a car, we carry home giant sized editions of toilet paper, mouthwash, detergent and so forth from Costco. We could buy some, maybe many, of those things from Gristedes, but we don’t. We don’t really even think about it. I decided to faux shop at Gristedes on Sunday, September 4th. At the middle of a holiday weekend, I expected to find their offerings at their weakest. Management is likely to be absent, and suppliers have not pulled up with fresh goods for a couple of days. The bright, clean look of the store is a huge leap forward from where it once was. Plentiful produce looks fresh, and the design is generally logical and makes things easy to find. Without question, Gristedes Mega Store carries a good variety of the things for which people commonly shop. Shop Rite brands throughout make prices competitive in general. 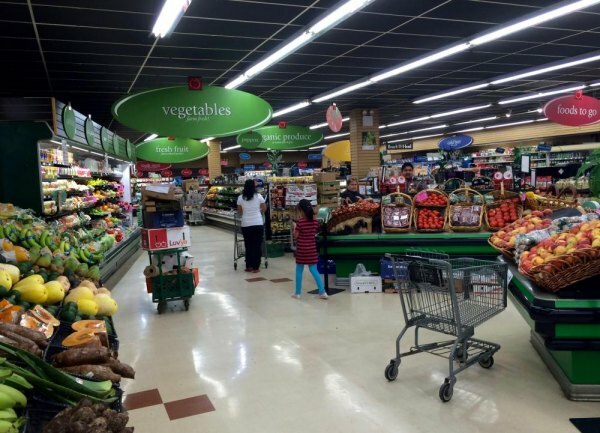 Note: a visit since this article was written found Shop Rite products disappearing from shelves. Updates to come. There can be oddities. For example, we like Rold Gold Pretzels but find it impossible to predict if they will be in the store from one week to the next. And for reasons that I can’t imagine, baby food is found in the drug store, which makes it hard to locate and unavailable during that departments more limited hours. A major bright spot was that, after sampling a couple dozen products throughout the store, I found only one offered that was past its sell by date, a package of fish that was a single day too old. Coupled with the fact that most of the goods had plenty of time remaining, even when I fished around to find anything tucked in back, that seemed more than acceptable for a holiday weekend. I probably could have found that anywhere. Personnel is not a bright spot at Gristedes, especially after the abundance of friendly, helpful and easy to identify folks at Trader Joes. As any capable retailer knows, a cheerful “Hello” or “Thank you” at checkout will improve every experience, and a “Did you find everything you wanted?” is basic consideration. Gristedes trains none of its people to do this, but that’s easy to fix, isn’t it? I went on my faux shopping spree with this question in mind: did James Catsimatidis actually come through on his promise to improve the store? In the face of competition, did he invest in serious improvements or hunker into defensive neglect as soon as the mayoral contest was over? To my surprise, I have to write that he and his management team have done a fine job of making Gristedes a welcoming and useful place to buy groceries and more. A “clean, well-lighted place,” the market has its shortcomings. All stores do, and theirs are minor. The design plays to local identity by naming checkout aisles after local features, and the one, big physical drawback, the dreary exit and unappealing exit are RIOC’s responsibility, not Gristedes, as Catsimatidis is eager to point out. For some, like us, our “mega store” on Main Street is unlikely to be option number one because of personal preferences, but for the average, everyday shopper, it’s an excellent local venue. The Roosevelt Islander blog carries their shopping inserts online every two weeks, so knowing what bargains are available is easy. I have a pair of cautions. First, Gristedes needs to do more outreach to encourage new as well as older, discouraged customers to give them another look. Positive results are likely. Second, extremely unwise decisions, like the one that lead to refusing WIC customers, many of whom are isolated on Roosevelt Island, should be avoided like snakes in a desert. The damages are completely unnecessary. Because of the unacceptability of Gristedes’s rejection of WIC, which hurts children unnecessarily, we can’t recommend using the store at this time, but we won’t ask you not to either. Gristedes can be a positive presence on Roosevelt Island, we are happy to say. Now, if we can just persuade them to open up for WIC checks again….